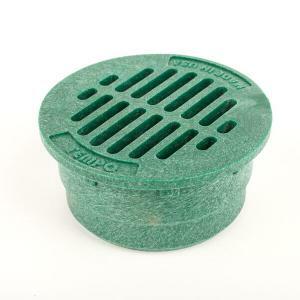 This durable round, flat drain grate is manufactured from structurally foamed High Density Polyethylene (HDPE). Including a UV inhibitor to reduce damage from the sun for dependable long life expectancy. Grates have large slot openings allowing greater flow while still preventing large debris from entering the drain. Made to fit directly to sewer and drain pipe and fittings, plus fits triple wall and corrugated pipe. Blends into surrounding very well and is made to be installed flush with ground level. This flat grate can be used for relatively small areas of grass, flower beds, patios, driveways, etc. without the need for a catch basin. Excess water flows towards and through the grate and then drains directly to below grade drainage pipe that allows the water to flow to areas where excess water can be tolerated.